Did you know that in addition to the technical library and conference materials, this website also hosts working group pages? Pages for the species-specific working groups for the streaked horned lark, Taylor’s checkerspot butterfly, and Mazama pocket gopher, which are also coordinated by CPOP, have been available for years. These pages provide background information on each species as well as working group documents such as minutes and action plans. 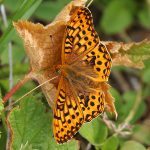 The Oregon silverspot butterfly, which was listed in 1980, has long had an active working group, but lacked a good online space for group documents. Click here (or navigate using the main menu) to see the group page. We’ll be adding many years worth of documents to the page in the coming months, so stay tuned! Do you coordinate a prairie-oak working group that lacks an online space for documents? Email ekim [at] cnlm.org to learn about getting a page for your group on the CPOP website.